Bolivian human backpack. People are used to carrying anything from groceries to children in their backs. This is a border between Chile and Bolivia in 6000 meters. Air was quite thin. We saw a group of Norwegian tourists in the border queue fainting from altitude sickness. They recovered after having some coca tea. It's a good medicine for altitude sickness, but unfortunately not a drug. It had no effect on us. Päivi alias Sancho Pancha fighting against Bolivian taxi mafia by walking. Taxes were the same kind of cheaters like everywhere else in the world. One taxi driver tried to charge us per person. Finally see how we travelled our last leg in Bolivia. The bus was sold to us as having sleeping seats (Bus Cama). The reality was opposite. We could hardly fit to sit there. So we made and distributed the following flier for collecting donations for the bus company to buy a real bus cama: Boycott OGLOBO buses in Bolivia - Campanya de boicot contra OGLOBO omnibuses. 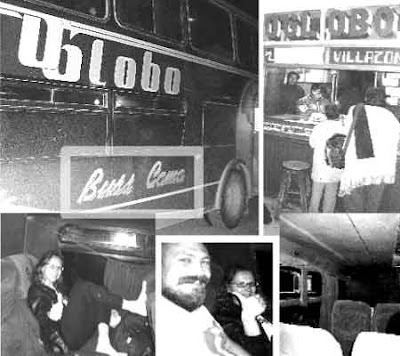 Keywords: Andes, Bolivia, Chile, Peru, Argentina, altitude sickness, coca tea, coca leafs, taxi mafia, Bus cama, OGLOBO.